For your Car Diamondbrite® NANO Ceramic Coating takes 6 hours, please contact +6012-3030788 for appointment. Life warranty with Free 250ml Conserver & Shampoo++ plus 6 Years Free Annual Inspection & Maintenance on your Diamondbrite® Protection. This is not a car polish process, it a car paint protection using NANO Ceramic Coating technology. This process makes into your car paint and protect it inside & not on the surface. It makes your car paint look Showroom Shining condition for at least 10 years without any need to polish your car. We also do Conserver Wash if you are not free. We also provide Respray and touch-up paint. **terms & conditions in warranty card apply. Shampoo 5 ltr. JU013-5 Conserver 5 ltr. Due to environmental demands, car manufacturers now have to use water based paints. Whilst being environmentally safe, they are prone to fading and oxidization. droppings (as long as it is washed off within 7 days and treated Diamondbrite Conserver). Diamondbrite's high gloss finish is the ease with which dirt and grime is washed off the paintwork. The vehicle can be washed as many times as required. The continued monthly use of Conserver maintains the protection and is essential to keep the guarantee valid for lifetime. Certain other paint protection products available do not have such maintenance procedures like Diamondbrite and it has been proven after a few month of normal use these products deplete and eventually disappear altogether leaving no protection. In order to maintain the paint and fabric protection to its optimum level an annual inspection is recommended. This inspection is normally carried out by your supplying Diamondbrite center. 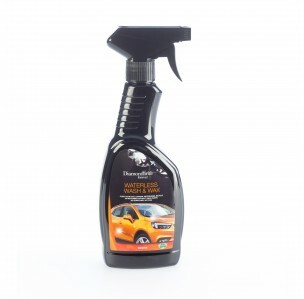 With Diamondbrite the vehicle can be passed through a car wash or jet wash as many time as necessary, as long as 25ml of conserver is placed on the front panels and bonnet. The car wash/jet wash will then distribute the chemical all over the paint ensuring continued protection. It should be noted that Jewelultra do not recommend the use of a mechanical car wash as it has been known for them in extreme cases to remove pieces of trim and scratch paintwork. With ever increasing designs and colours being made available from vehicle manufacturers, there is an increasing emphasis towards maintaining the vehicles interior as well as its exterior appearance. Fabric Protection - After treatment with Jewelultra Fabric Protector your fabric will be guaranteed for the life of the time you own the vehicle against everyday spills and stains. Each fibre of fabric is coated with a resin based invisible coating which will not wash out and provides protection from tea, coffee, hot chocolate, alcohol, milk, fruit juices, cola, fizzy drinks, grease from food stuffs (e.g. takeaway and fast food) chocolate and confectionary. Carpet Protection - Your vehicles carpet probably take more abuse than any other part of the car and unless professionally cleaned on a regular basis loses their original appearance. Ground in dirt can work into the pile of the carpet and wear it out. Simple vacuuming will not bring dirt to the surface. Diamondbrite Carpet Protection seals the base and surface fibre to prevent liquids from soaking into the cars carpet and foot well areas, meaning dirt and grime (including dog hairs) can be easily removed. Leather Care - Jeweultra Leather Feed and Cleaner is a specialised cleaner which preserves leather, keeping it supple and flexible. Provided as an option on all Diamondbrite after care packs it prevents leather from drying and cracking. This should be applied at regular intervals to maintain the quality of the leather.